Budget travellers to Ko Kho Khao, this is your place. This small concrete guesthouse just 50 metres from the pier has the same owner as Ha Pla resort, we were told, but the style couldn’t be more different. Roo Poo is set in a two-storey concrete building in cheerful yellow with a small garden out front, and a lobby area with some sofa seating and a library. There is no restaurant at Roo Poo but dining is easy to find in the area, and they have self-serve coffee and tea available for free at the reception desk. Each room has a firm double bed, tiled floor, small private bathroom with a hot shower, and a decent WiFi connection for no extra charge, with a choice of air-con or fan. There are no views at all and no beachy atmosphere, but the sand is less than 1km away and it’s easy enough to arrange for transport up to more beaches further north. It’s not ideal if you’re seeking some island ambiance, but Roo Poo is cheapest place you’ll find on the island – great if you just need a base for exploration and a room to throw your bags. A relaxed and friendly place, and it’s exceptionally clean, too. 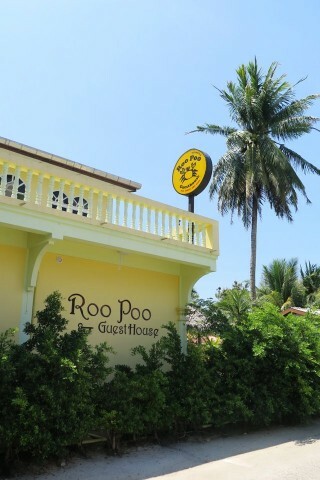 Check rates at Roo Poo Guesthouse on Booking.com.